Criticisms of YouTube's automated "takedown" process are nothing new. The way Google handles complaints against clips, whether by rights holders or concerned parties, is basically to shoot first and ask questions later. Latest example: the main YouTube channel for Yogscast, the online show that made its name with Minecraft videos - and which has over 4 million subscribers - was blocked for hours earlier today when it was falsely flagged as being run by a 13 year-old. Which it is not. Something Google should know, since Yogscast is a featured channel, and thus had already had to verify with YouTube their ID credentials. A human being could have easily found this out, but Google's takedowns are handled by robots, and robots are lacking in compassion (and also basic investigative capabilities). Sounds minor, especially when you consider the site was back up and running within a few hours, but for these guys, that's a big deal! 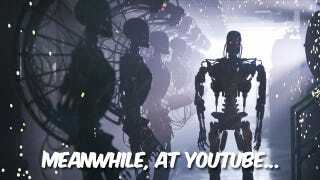 If only James Cameron could have seen that the 21st century's biggest problem with AI was not their wish to kill us all, but to judiciously take down our YouTube videos.